Turbine flowmeters are engineered to accurately measure the flow of liquids and gases in pipes. They measure flow on a volumetric basis. Turbine flowmeters are applicable to clean fluids over a pressure range from sub-atmospheric to over 6,000psi and temperatures from -450 to about 6000 degree Fahrenheit. Turbine flowmeters produce output signals that are electronic pulses but other output signals – analog(4 – 20mA), visual or digital- are available. This houses the turbine rotor, shaft and bearings .Turbine meters housing are usually manufactured from stainless steel although turbine meters intended for municipal water service are bronze or cast iron. They are also available in a variety of other materials including plastic. The rotor, mounted on a shaft, rotates when fluid passes through the turbine meter. The rotor and bearing materials are carefully selected to match the process fluid and the application. Rotors are often made from stainless steel while the bearings are commonly made of graphite. Other materials such as tungsten carbide, ceramics are also used. In specialized application, synthetic ruby or sapphire combined with tungsten carbide may be used. Turbine meter Bearings and shafts are designed to provide minimum friction and maximum resistance to wear (wear being a common problem with turbine flowmeters). The pickup is the sensor is used to detect turbine rotor movement. It is essentially a coil of wire positioned close to a permanent magnet in a compact arrangement. Magnetic flux through the coil’s center increases and decreases as the passing of the steel turbine blades presents a varying reluctance (“resistance” to magnetic flux), causing voltage pulses equal in frequency to the number of blades passing by each second. It is the frequency of this signal that represents fluid velocity, and therefore volumetric flow rate. Several types of solid state pickup sensors- reluctance, inductance, capacitive and Hall Effect pick-ups- are used in turbine meters. Mechanical sensors (gear or magnetic drives) are commonly used as pickup devices in turbine meters for the water distribution industry. How the Turbine Flow Meter Works. The turbine meter is an accurate and reliable flowmeter for both liquids and gases. It consists of a multi-bladed rotor mounted at right angles to the flow and suspended in the fluid stream on a free-running bearing. The diameter of the rotor is slightly less than the inside diameter of the metering chamber, and its speed of rotation is proportional to the volumetric flow rate. As fluid passes through the turbine meter, its rotor rotates. If the effects of friction are ignored, the turbine rotor will revolve at a speed directly proportional to the velocity of the flowing fluid. The turbine meter measures volumetric flow, however the pulses produced vary depending on the meter. The variation is accounted for by a K-factor. The K-factor is the number of pulses per unit volume. It is primarily determined by the size and type of the turbine meter. Due to manufacturing tolerances, the actual K-factor can vary between similar models. The K-factor is applicable only to the fluid for which the meter was calibrated in the factory. From the graph, the minimum flow that will guarantee a linearity of -0.25 or +0.25 is 100litres/min. Flow rates below this will plunge the turbine meter into non-linearity. The turbine meter is one of the most accurate flow meters around. 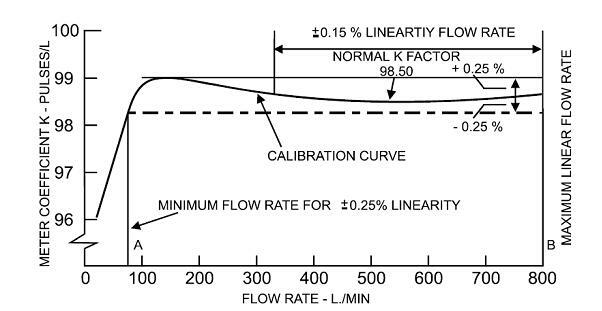 Their accuracy is typically given in percentage of actual flow rate (%R). (2) Temperature range of fluid measurement: -450 to +6000 degree Fahrenheit. (3) Very high-pressure capability: 6,000psi. (4) Measurement of non-conductive liquids. (5) Capability of heating measuring device. (6) Suitable for very low flow rates. (1) Not suitable for high viscous fluids. (2) Viscosity must be known. (4) Not effective with swirling fluids. (5) Only suitable for clean liquids and gases. (6) Pipe system must not vibrate.